Renewables are big business nowadays and companies are cropping up all over the place offering businesses and homes great new deals if they want to install solar panels, wind turbines, biomass boilers and heat pumps, to name but a few. There’s no doubt that having renewable energy technologies such as these can have huge benefits for home and business owners, as well as the environment, but what if you can’t afford to have them installed? Is it a good idea to opt for a free renewables installation? A growing number of companies offer renewable technology with free installation, particularly for domestic properties, giving the chance of clean and more efficient energy production without that initial large financial outlay. Why? There are two main reasons installation companies can put your solar panels in for free: They are Government initiatives called the Feed in Tariff (FiT) and the Renewable Heat Incentive (RHI), both designed to entice people to move towards more sustainable energy as we try to combat the effect of climate change. When most governments began to embrace the green agenda they quickly realised that people would need some kind of incentive to change from fossil fuels to more carbon friendly ways of heating their homes and businesses and powering their myriad devices. Nowhere was this more obvious than in technologies such as solar panels and wind turbines, the most well-known and widespread of the renewables. When you have a renewable technology such as solar panels installed you start creating your own electricity. The excess that is produced can either be wasted or fed into the National Grid, helping to contribute to the energy supply of the country. The Feed in Tariff is the amount that electricity companies pay you to provide that electricity – which means, if you have invested in the installation yourself, you can benefit from cheaper electricity and make a profit from the energy that you sell off. It is one of the major selling points of buying into new technologies for both domestic premises and businesses. 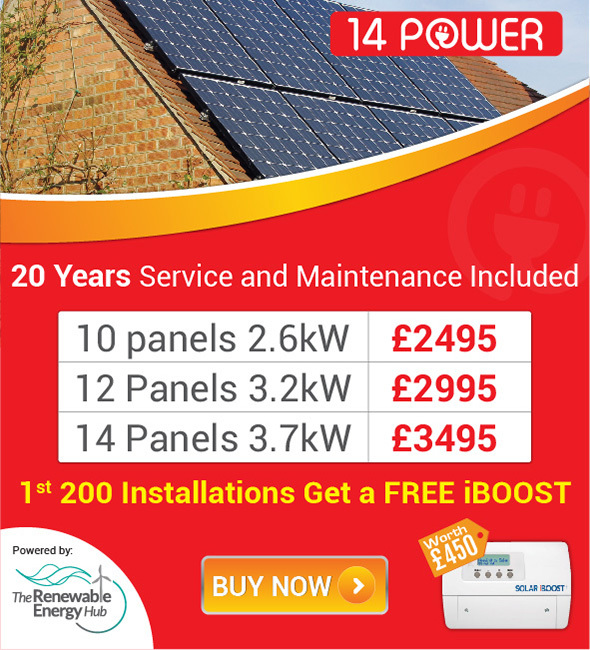 Find out more about the Feed in Tariff. And if you want to get your solar panels or hydroelectric plant installed for free, then there are a number of companies who are now offering to do just that in exchange for the profits from the Feed in Tariff. What it means is that you get the installation without the initial outlay, with cheaper electricity, but you don’t benefit from selling the excess energy to the Grid. One of the most popular renewable energies available are solar panels which can be fitted to most roofs and provide a localised source of electricity. The cost of an average 2.5 kW installation is around £6-7,000 and would save you on average about £130 a year on your fuel bill. The payment you would get for the Feed in Tariff would be in the region of £900 per year which means that you would have paid off the initial investment for installation within 7 years and would start making a profit thereafter. If you want to take advantage of free solar panels then you get the reduction in your fuel bill without the benefit of the Feed in Tariff payment. There are a growing number of firms that are now offering the installation of free solar panels in your area and you can search our database for a company near you today or contact us on 08458629910 for our expert recommendations. Wind turbines are a little different from solar panels as they are not usually suitable for domestic premises that are located in a built up/urban area. Many farms and rural businesses, however, have looked at installing a wind turbine and turned a healthy profit. You can either rent out your land for a power company to install a wind farm on or you can give up access to the Feed in Tariff in exchange for free installation and cheaper electricity. Some companies offer a variety of installation options from buying outright, a joint venture, to free installation with the company paying the landowner rent for the lifetime of the wind turbine. A similar arrangements can be made where the landowner sees their property leased to prospective parties and benefits by getting as much free electricity as they need. Compared to other renewable technologies, hydroelectricity has lagged behind with the growth in carbon friendly technologies. The good news is that it is starting to catch up pretty quickly with many communities setting up an installation that both saves on electricity costs and protects the environment. Whilst there are no companies that are currently offering free installation, this may well change as the technology becomes more popular. Grants have been made available for larger installations that are community based and the technology benefits from being eligible for the Feed in Tariff make it an increasingly attractive proposition. Combined Heat and Power or CHP covers a range of renewable technologies that can provide both heat and electricity and includes a range of generators. It’s not a new technology but has been more popular in the commercial and industrial sectors than in domestic, though this is beginning to change rapidly with Micro CHP systems. As with hydroelectricity there’s no reason why these systems couldn’t be available as free renewables as they produce electricity and can benefit from the Feed in Tariff. The question is whether the energy produced is enough to offset the initial cost of installation of between £1,600 and £5,000. FlowEnergy offer a competitive package at the moment whereby the boiler is installed free and the reduction in heating and electricity costs is used to help pay for the installation. It means making a commitment to the energy company for the duration of the repayment on the boiler but you end up paying your existing rate. The Renewable Heat Incentive (RHI) is an initiative that aims to encourage businesses and homes to take up more eco-friendly heating technologies such as biomass boilers and heat pumps. The program was introduced for businesses back in 2011 and domestic premises came in line in 2014. It is aimed mainly at those who are off the gas grid and works for a range of technologies in the same way that the Feed in Tariff does. Biomass boilers use the burning of fuel such as wood chips, pellets or logs to produce things like hot water and is considered eco-friendly because the amount of CO2 produced is the same that was absorbed whilst the plant material was growing. Biomass is generally considered ideal for off-gas locations and can cost from around £4,600 to install a small system up to £19,000 for something larger and more complex. As with solar panels, many companies offer free installation of a biomass boiler on the stipulation that they have access to the Renewable Heat Incentive Tariff. Others offer a similar incentive to those who want to install a boiler, specialising in schools where budgets may well be tight. Ground and Air Source Heat Pumps take the latent heat in the surrounding environment and turn it into warmth for your home. They basically work on the same principle as your fridge but instead of producing cold air they produce heat. The cost varies depending on the amount of installation work that is needed. Ground Source Heat Pumps may require a considerable amount of excavation whilst Air Source Pumps can be easily fitted to an outside wall. That means the price can vary between £6,000 and £16,000. The free installation of heat pumps hasn’t taken on with suppliers as much as other renewable energies but this could change for domestic premises as the Renewable Heat Incentive becomes more popular. One reason could be that for a heat pump to be effective it has to be fitted into a new build – old buildings tend to have too many draughty places where heat can be lost and heat pumps rely on supply of a low heat over a longer period of time. Solar thermal panels are different from the everyday ones you see on roof tops in that they are designed to collect heat and warm up your home rather than supply electricity. In general, you would be looking to pay between £3,000 and £6,000 for the system installation and you would benefit from the Renewable Heat Incentive that means you could get money back for every kWh that you produce. Again, as with heat pumps, the companies that offer a free renewables installation in exchange for your RHI payment are currently few and far between but that may be set to change over the next few years. If you do not have the initial finances to get renewables free, then it could be a good idea to go for one of the schemes that are currently available. You get a clean energy source and a reduction in your energy bills, and often the company concerned provides free maintenance over the lifetime of the installation. There are, however, a few caveats that you need to take into consideration when deciding whether or not to sign that free renewables contract. First of all, the company doing the installation will need to be sure that your new solar panels or wind farm is going to make a profit for them from the Feed in Tariff. That may be the reason why renewable technologies such as biomass and heat pumps have yet to catch on with companies, who may prefer to combine it with something like the Green Deal. If, for instance, your roof is too small, it will not generate enough electricity from solar panels to sell back to the grid. Secondly, you are going to be tied into a lengthy contract with the company. The average lifespan of a solar panel installation is around 20-25 years which means, while you will get cheaper electric bills, they will still be collecting on your Feed in Tariff. This also makes it problematical if you chose to sell your property and whether the new buyer would want to take on the responsibility of the contract. You won’t be able to make any money from the Feed in Tariff and this is often the most lucrative part of having solar panels or other renewable technologies installed. If you make the initial investment yourself you could be seeing a return on investment within six or seven years. After that the rest is pure profit for the lifespan of the system. It could be that more companies will be coming forward in the future offering free renewable energy deals in exchange for something like the Feed in Tariff or Renewable Heat Incentive. If you have a low income and can’t get access to the finances or the loan for the installation then it may make sense to go for free solar panels or other available technology, but you need to be aware that you will be tied into that lengthy contract for delivery. At the Renewable Hub our advice is to do your research first and make sure you have explored all the avenues of finance. You could take out a loan with your bank or building society or you could have Green Deal assessment and take out a financial arrangement that is paid back through your energy bills. Find out more about the full range of renewable energies available here.